It’s not often that I visit Busch Gardens Williamsburg twice in a 12-day period, but when the opportunity to cover Tempesto’s media day arose, I jumped at the chance. 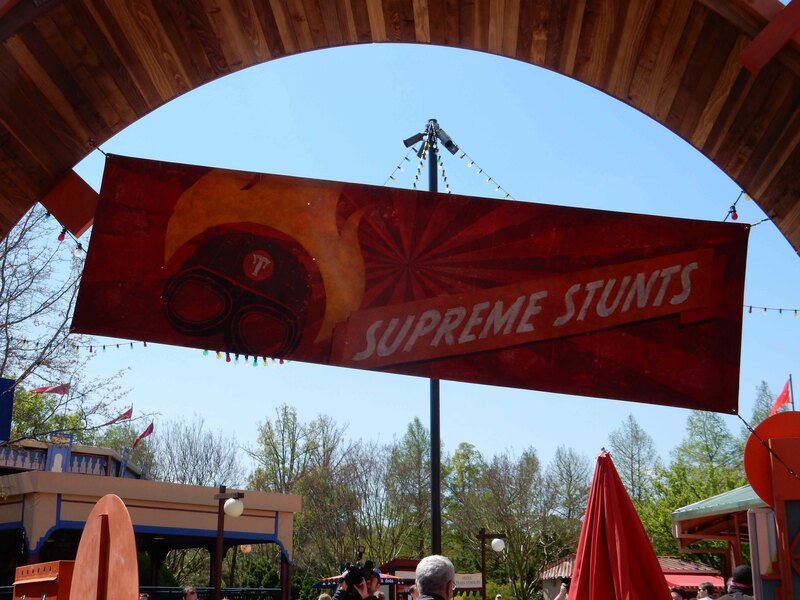 Named after the fictional Italian Daredevil, Tempesto, this Premier Rides coaster features three launches as riders soar to heights of 150′ while reaching top speeds of over 60 miles per hour, all while recreating Tempesto’s most famous stunt. 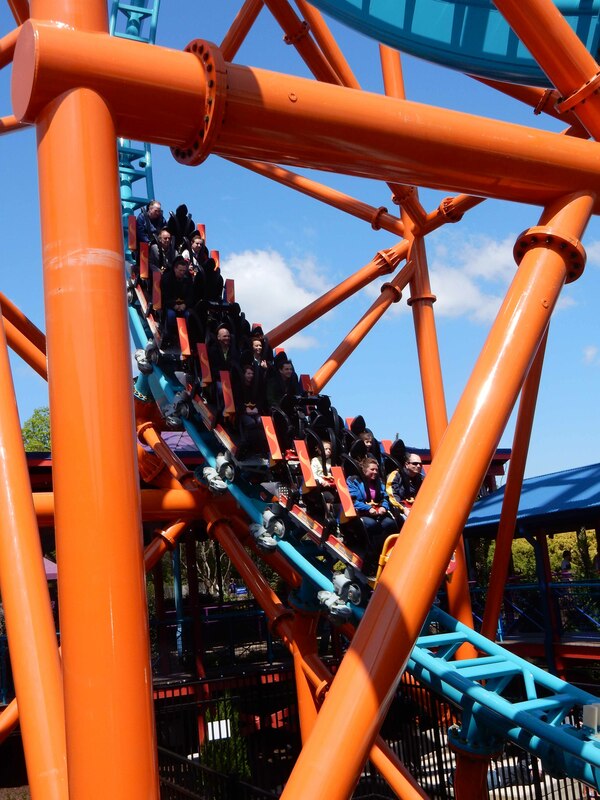 Tempesto is Busch Gardens Williamsburg’s 7th Roller Coaster, and the first manufactured by Premier Rides. Different from Superman: Ultimate Flight at Six Flags Discovery Kingdom, a near-identical (if not an exact replica) Premier Rides layout, Tempesto features one train of three cars, with six seats in each car. (Compared to Superman’s Two Car Train). Tempesto features a unique two-piece restraint system; a lapbar with additional shin restraints (not unlike a Flying Coaster), and a “comfort collar” that came over the head and buckled into the lapbar. While a little hard to get into, I found the restraints to be very comfortable throughout the ride experience. Tempesto begins with a launch out of the station, almost immediately into a vertical climb. The train makes it nearly 3/4 of the way up before free-falling back to earth in reverse, hitting a second LSM launch in the station,sending riders up Tempesto’s final curved drop in reverse. Gravity takes over again, and the coaster train flies through the station into the third LSM launch, and the coaster’s full cycle begins. Riders accelerate up the 150′ high vertical hill, turning 180º and cresting the hill. 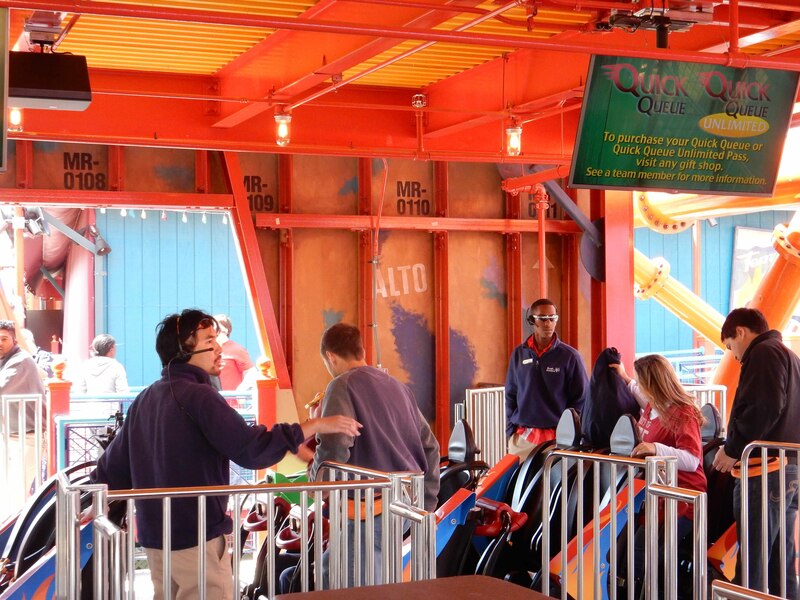 From there, Tempesto goes into a very slow zero-G roll. Very slow is almost an under-exaggeration. I felt myself hanging on tight as the clockwise rotation happened, and the train continued on its path. 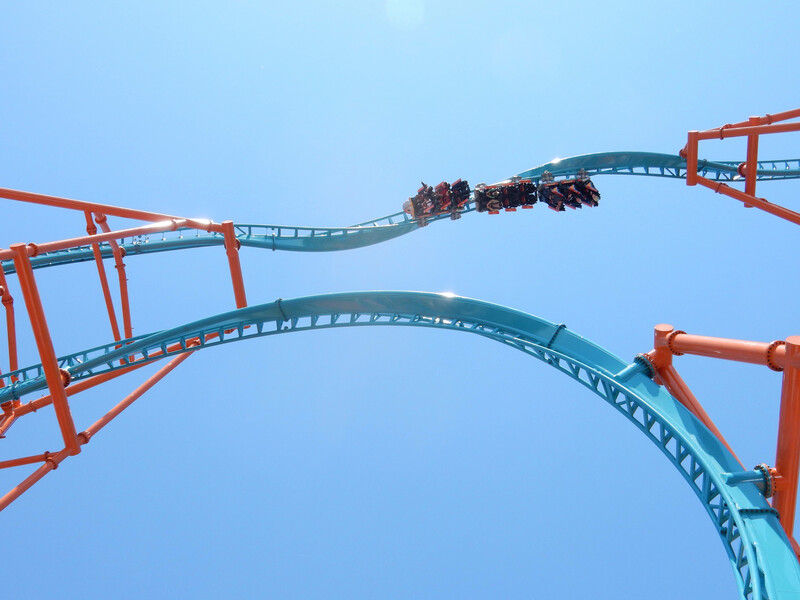 After the roll, riders dive straight down, again with a 180º turn into a non-inverting loop, and one final near vertical drop. The train goes through the station, back up the initial hill, and eases backwards into the station to complete the cycle. Each of Tempesto’s cars provided a unique ride experience. My first two rides were in the first row of the second car; row 4 of 9. To me, this row provided the tamest (tame being a relative term) experience of the day. Being in the middle of the train, you weren’t subjected to the two extreme heights (up the first hill for the first car, or resting near the top of the last hill for the last car) or forces of the first and second launch. For my third ride, I rode in Row 1. The initial launch out of the station and subsequent free-fall provided some of the strongest negative g-forces all day. Complete weightlessness. What an incredible feeling. On my fourth ride, I rode in row 7, first row of the third car, and the drop between the second and third launch was great as well. Hanging in the curved drop, and letting gravity pull us back to earth gave me that classic “back row getting pulled over the crest of the hill” feeling. After my 5th ride, (front row again) it was time for a quick snack. The Busch Gardens culinary team had prepared samples of their new “Tempesto Panini.” It was grilled mozzarella cheese and sun-dried tomato pesto on garlic bread. It was definitely something I’d consider eating again on my next trip to Busch Gardens Williamsburg. 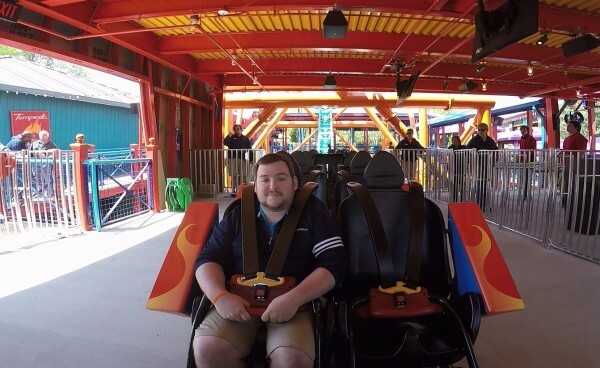 I had time for one last ride on Tempesto before I had to head home, and I wanted to take advantage of the opportunity for a “Reverse POV” video of me conquering Tempesto. There’s not really much I can preface this video with, other than this tweet. Enjoy. Lesson I learned at Tempesto Media Day: It's impossible to look cool while riding a roller coaster. Overall, I definitely enjoyed Tempesto. It has a great re-ride factor, and I hope that I can make it back to Busch Gardens Williamsburg soon to ride again. Bravo to the park and to Premier Rides for bringing this to Williamsburg! 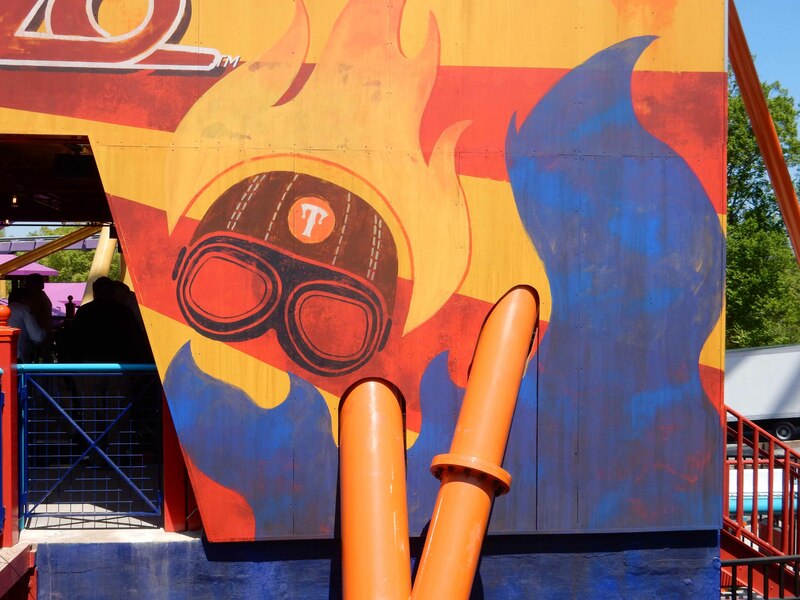 -The Tempesto Ride Ops Team was incredibly efficient. It was tough to get a good read on how the ride’s capacity would be, as they were constantly adjusting cameras and microphones, prepping for reverse POV videos, etc, but I have faith that the Operations team will have Tempesto moving like a well oiled machine. -The location of Tempesto works perfectly for the amount of space that the ride requires, and while I was skeptical at first, I think it works very well for the area. -Not sure if this was just for the media, but the Tempesto team provided “fanny packs” for those riding, so people could put their loose articles in them while riding. I thought this was a great idea, and if it is adapted once the ride opens, I think it’s a trend that could spread to other parks and rides around the country. -Shoutout to everyone I met from BGCabana.com, COASTER-net.com, and CoasterRadio.com. Great to meet you all! -Thanks again to Busch Gardens for hosting us today! 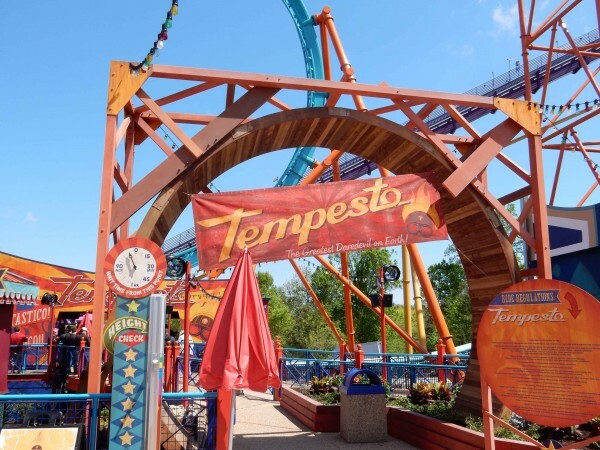 For more information on Tempesto, be sure to visit Busch Gardens Williamsburg’s Website, and Follow them on Twitter and Facebook! 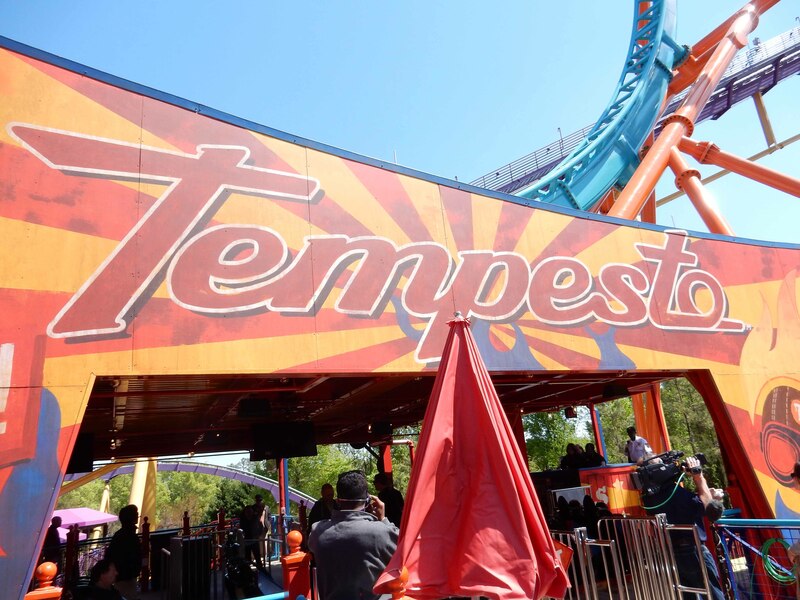 Are you excited to ride Tempesto? Let us know in the comments below!